Two Nights, 40 Beers sounds like a lot – it was – 40 beers of fun! A writer for Philly Beer Scene recently posted for help in reviewing beer for an upcoming article. Of course, this gal had to try and be one of the lucky 15-20 folks to garner a spot on the panel and woohoo I was. Two nights, 40 beers! Not only was it fun getting to try 40 different beers for FREE but being given the opportunity to hang out with some fellow craft beer lovers that I haven’t met before, hear about their beer likes/dislikes and their recommendations for different beer places to visit is always makes for a good time as well. The tasting took place upstairs at Bottle Bar East – bonus I had never been so got to try out a different beer bar as well. First thing – parking. Street parking only folks but I managed to find a spot nearby fairly quickly. (2nd night it took some time but finally snagged a spot). Once I arrived at Bottle Bar East I made my way upstairs to where the tasting would be taking place. When one first enters Bottle Bar East your eyes are immediately drawn to the cold case displays to the left of the entrance. It’s a beautiful display of individual craft beer bottles for sale. One can take them home or drink them on premise. To right of the entrance is the cashier, straight back are the stairs (that lead to a 2nd floor seating area) followed by a long bar on the right and about 4 to 5 high top tables to the left and the “kitchen” is in back. I made my way upstairs for the tasting where each table was set up with water and tasting forms. 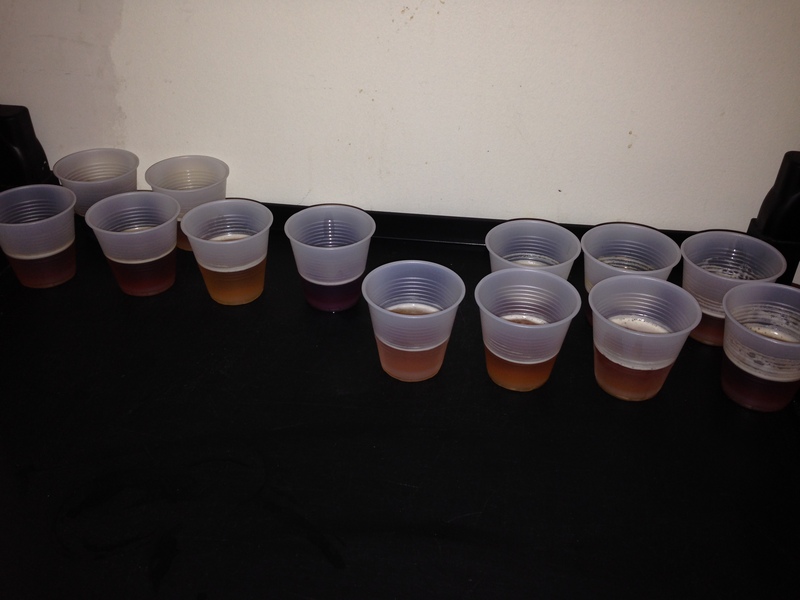 The first night was a blind tasting of 20 beers approximately 15 of them either IPA’s or Pale Ales. For each beer we were told the style and alcohol content but that’s it. Each person had a sheet to jot down a few tasting notes/descriptions plus a score from 1-10 with 10 being the best. For a non hops lover it was a bit of hops overload but I managed. However, towards the end my tasting notes took a nose dive eventually leading to a one word description for one of the beers – No. By this point I was pretty sure hops were sprouting from my tongue. I couldn’t wait for some malty goodness to hit my taste buds. 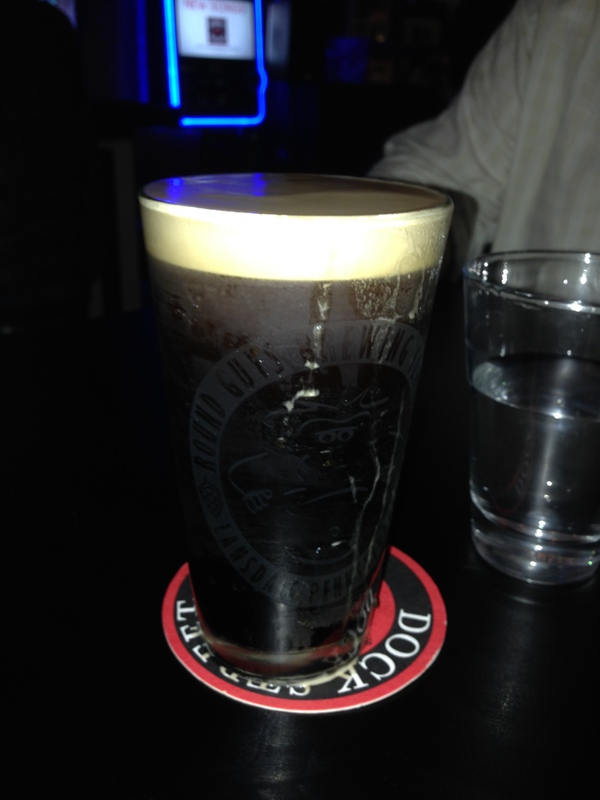 Yards Love Stout to the rescue. Oh my taste buds were so happy to be coated with malts, roasted chicory and chocolate. 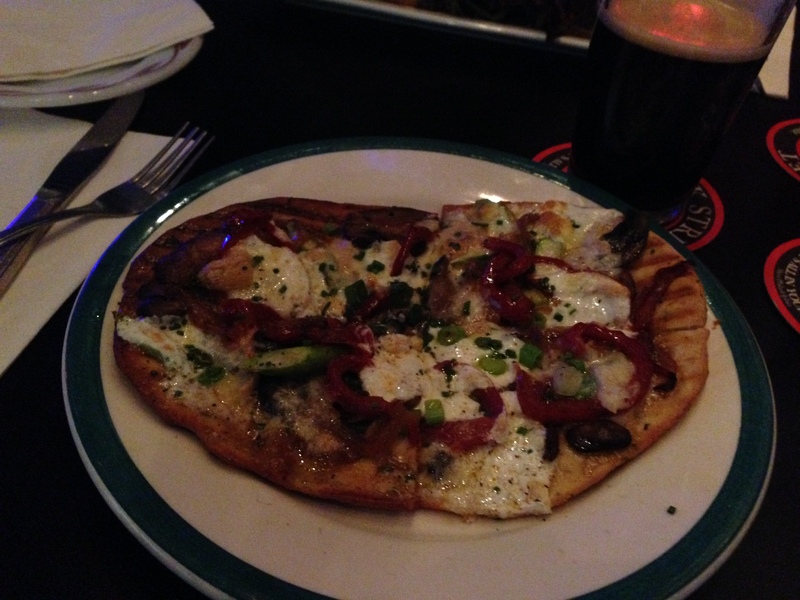 I enjoyed this malted beauty with the Roasted Vegetable Flatbread that was down right tasty. My taster buddy enjoyed the Buffalo Chicken Sandwich. Side note: sandwiches come with salads since fries are not served at Bottle Bar East. In fact, it would seem there is no deep fryer at all, which I find pretty cool, leading to some different bar menu options. By this point murmurs of speculation as to what the article was about were swirling around with the tasting panel. All we knew for sure was that we really didn’t have a clue. 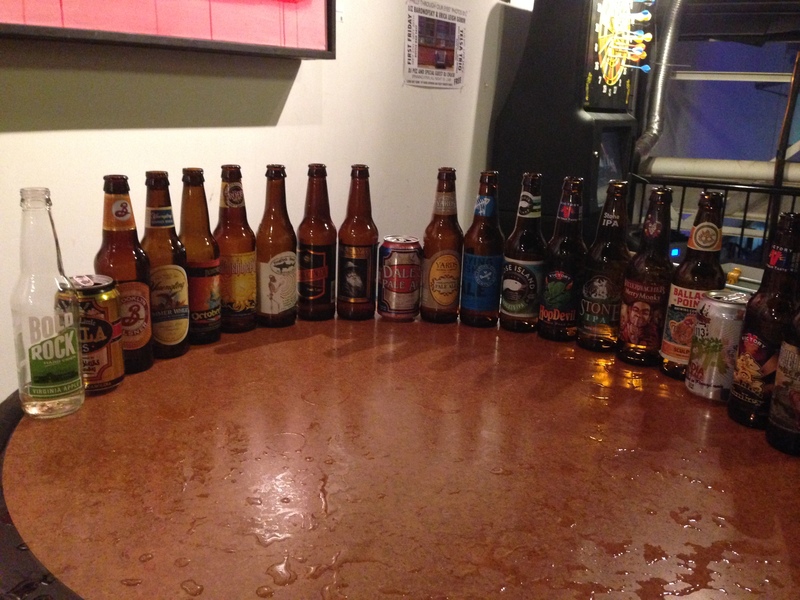 We were told we find out the names of the beers from the blind tasting and what the article is about in a few weeks. Looking forward to both. For night two we were informed of the beer name and style and bottles were put out on display – no blind tasting this time. The styles varied a bit more on night two but still leaned towards hops. Food was available for purchase each night but the folks I shared a table with all agreed that we didn’t want food skewing our judgment of the beer. 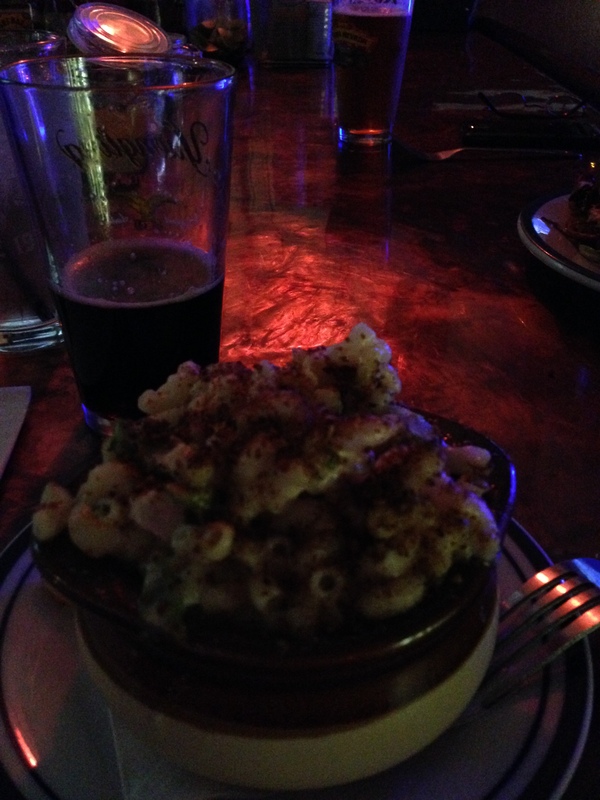 As we all know a beer on its own vs. paired with food could alter ones judgment of the beer. Night 2 leaned towards “local” brews. I don’t want to say much more than that since the article hasn’t been published yet. I will say that I was happy when Weyerbacher Merry Monks made an appearance. By around beer 14 it was obvious some of us were losing steam and short on words to describe the beers but we managed. At this point I was thankful for the wall behind me. Having a wall to lean on is so underrated. By the end of the panel tasting I found myself daydreaming about some malts; so my taster buddy and I headed downstairs to the bar. BTW – hooks under the bar for hanging ones belongings – love it! The experience at Bottle Bar East was a bit different on this night compared to the previous evening. Night 1 the service was excellent and very attentive, unfortunately, I can’t say the same for night 2. As a former bartender, I understand wanting to spend some time chit chatting with friends that stop in for a beer but PLEASE remember you have other customers as well. Wait on customers and then chit chat – that is the order. Grrr, pet peeve. 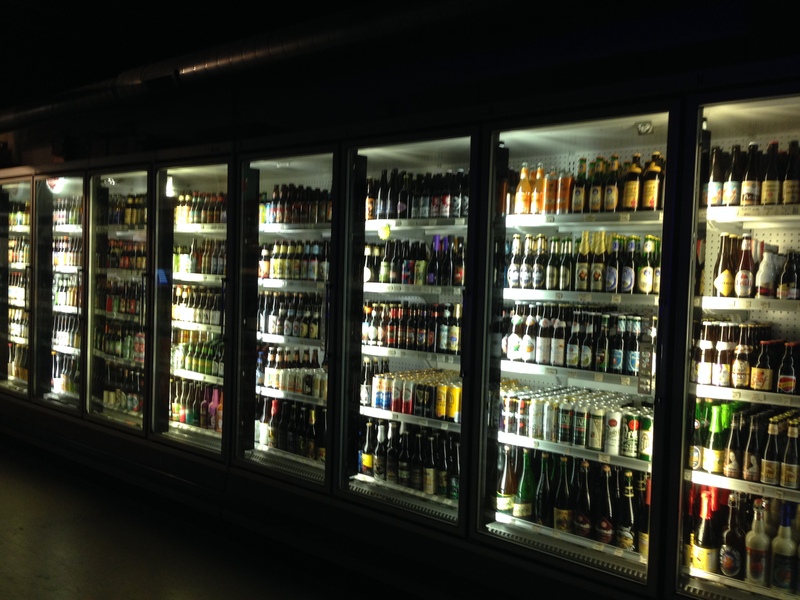 At Bottle Bar East there’s a good varied selection of beer on tap to choose from plus the wonderful selection in the cold case. However, I wanted something on tap, just tried 20 beers and still had a drive home ahead of me so something not real high in alcohol content was preferred so, once again, the Yards Love Stout won. This time I paired it with the homemade Mac & Cheese with asparagus mixed in. This was a wonderful crock of stick to your ribs comfort food! The 2 night experience was a blast. 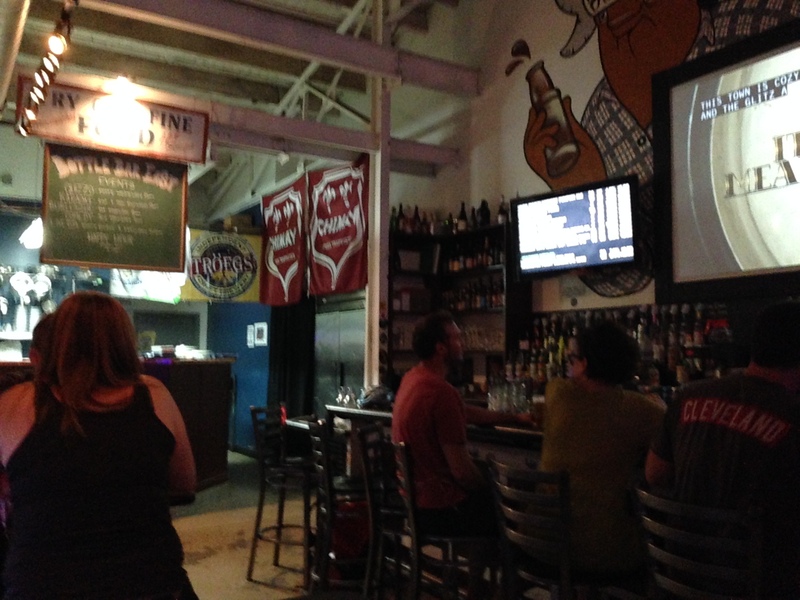 I got to taste 40 beers, meet new people and try a place I didn’t even know existed – all in all pretty cool! Plus, after 40 beers in 2 nights I was temporarily beered out. Not something that happens often, if ever.